What do you call a book that helps marketers, entrepreneurs, product teams, branding, sales use improv to generate and tell massively creative stories, come up with better products and services and content and banish boring? You’d call that a must-read. 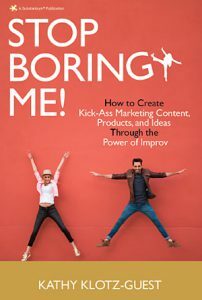 That’s “Stop Boring Me!” Innovation + Improv = Idea Orgasms for Content, Products, and Storytelling! “Stop Boring Me!” was named a must-read book for 2017 on Inc.com! If you are a rigid thinker in a rigid company, put this book down and walk away right now. But if there is any creativity left in you, read Stop Boring Me!. It’s what you need to unlock the storytelling power of your own brain. And it’s a blast! Better Presentations with Humor. Don’t Present; Connect! 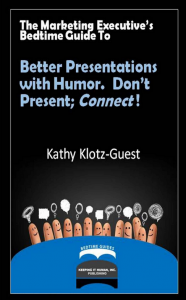 This ebook focuses on how to connect with your presentations by using fun and humor. Humor is so much more than jokes. From analogies, metaphors and wordplay to video, images and exercises, there are so many things speakers can do to engage and connect more authentically with their audiences. There is something in here for every speaker! 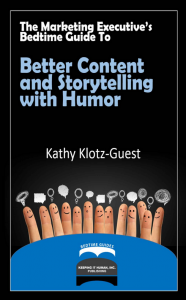 Comedy and improvisation can make us all better marketers and make our content more fun and more human. And who doesn’t want that? Humor is human, after all! Laughter lowers the intellectual shield your busy prospects have up all day just to survive the messaging onslaught. Want more tips? Get the ebook today.